On Saturday, September 13, three of NRA-ILA`s Election Volunteer Coordinators (EVC) were recognized for their activities in 2002 and received NRA-ILA`s highest volunteer awards. Each of these worthy recipients received their award from NRA President Kayne Robinson and NRA-ILA Executive Director Chris Cox. Denny Watkins of Middletown, Ohio, is a tireless defender of our Second Amendment freedoms on all fronts. Not only is Denny a Life Member of both the NRA and the NRA-affiliated Ohio State Rifle & Pistol Association, he is also an active member of many local pro-gun organizations, including the Miami Valley Friends of NRA Committee (where he has served as Chairman & Co-Chairman), Middletown Sportsmen`s Club, Inc., Fort St. Clair Gun Club, Inc., AK Trap Club (where he has served as President), Butler County Sportsmen Rifle & Pistol Club, and Mercer County Sportsmen`s Alliance, to name a few. Within these organizations, Denny is an educator, activist, volunteer, leader, and role model for all gun owners and shooters. In 2001, Denny volunteered to become the EVC for Ohio`s 8th congressional district. During the critical 2002 election cycle, Denny was involved in many grassroots activities, including attending town-hall meetings, writing numerous letters-to-the-editor to local and national newspapers, distributing yard signs, working on Get Out The Vote efforts for pro-gun candidates, assisting with campaign events and rallies, manning pro-gun tables and booths at county fairs and various other events, and meeting with lawmakers and candidates on a regular basis. Thanks to his hard campaign work, major pro-gun victories last year included Jim Petro`s election as the Ohio Attorney General, the re-election of U.S. Representative John Boehner, and the re-election of State Representative Shawn Webster, who has said that Denny is an "ardent supporter" whom he consults with regularly on Second Amendment-related issues. Denny Watkins was nominated by numerous citizens across Ohio who support the Second Amendment. They include an officer of the Ohio Department of Natural Resources, a pro-gun Ohio State Representative, a public school principal, and numerous gun club officials. 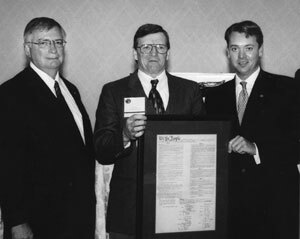 Dave Conway (EVC, SD-AL), with NRA President Kayne Robinson and ILA Executive Director Chris Cox Having to cover 77,116 square miles is a monumental task for one volunteer to organize NRA members and gun owners in South Dakota. The vast distances of wide open prairie alone are intimidating. Yet, one member has stepped forward to take on the task - South Dakota Election Volunteer Coordinator, David Conway. Originally a native of Boston, Dave left the Bay State in search of open space and a state government that trusts its law-abiding citizens. Dave started with the NRA state affiliate, the South Dakota Shooting Sports Association, and quickly rose to become its Legislative Affairs Director. "Just being a member of a pro-gun organization isn`t enough anymore." Conway says. "You have to give something back." Few give more than Dave has. He has worked with ILA lobbyists through the years to improve on South Dakota`s existing gun laws. His ability to foster close relationships with public officials has garnered countless positive changes for South Dakotans. David has often noted that he took on this role for his daughter`s future. He is one of those very determined individuals who pulls more than his fair share when it comes to defending our common firearm freedoms. Formed 14 years ago to fight the City of Denver`s attempts to ban numerous semi-auto firearms, the Firearms Coalition of Colorado (FCC) exemplifies just what it means to be a "volunteer organization." During the last 14 years, working side-by-side with NRA-ILA, FCC has steadfastly continued its efforts to thwart countless attacks by anti-gun politicians at the local and state levels. These are the ladies and gentlemen that you commonly find working at 3:00 a.m. if that is what it takes to get the job done. True to form, during Colorado`s pivotal 2002 legislative session, members of FCC once again stepped forward to offer their resources and expertise. FCC members provided critical, expert testimony and extensive grassroots support in advancing Right to Carry legislation, statewide preemption, and numerous other pro-gun initiatives. Thanks largely to FCC`s dedication and perseverance, all law-abiding Coloradans have the opportunity to defend themselves and their families outside of their homes. Additionally, in passing statewide preemption, the city of Denver can no longer circumvent state law to enact its own draconian firearms regulations. On the election front, the FCC proved just as determined and successful. Utilizing an efficient and vast network, the FCC worked to elect pro-gun candidates, and played an integral role in the defeat of key gun-banning politicians throughout the state. Colorado`s law-abiding firearm owners owe a great debt to the FCC, and NRA-ILA is proud to have them as an affiliated organization as we work together to achieve our common goals. Steve Schreiner and Len Horner were on hand to receive the award. 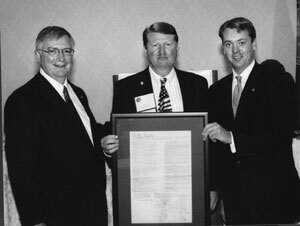 It was with great honor that the NRA-ILA bestowed the 2002 NRA-ILA Jay M. Littlefield Volunteer of the Year to Denny Watkins & Dave Conway, true defenders of our firearm freedoms. 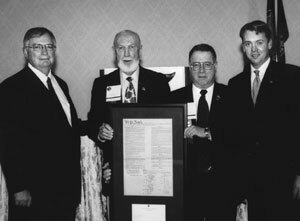 Equally deserving in their receipt of the 2002 NRA-ILA Volunteer Organization of the Year was the Firearms Coalition of Colorado. Each received a framed copy of the Bill or Rights that included a letter signed by NRA President Kayne Robinson, NRA Executive Vice President Wayne LaPierre, and NRA-ILA`s Executive Director Chris Cox. On behalf of the entire NRA-ILA staff and the nation`s 65 million law-abiding gun owners, we extend our deepest thanks and sincere gratitude for the work of the 2002 award winners!